Ormeus Global emerged as a faceless company in mid 2017. In our published Ormeus Global review, our research revealed the company was John Barksdale jumping on the MLM cryptocurrency bandwagon. Ormeus Global had no retailable products or services. Its affiliates invested funds into B2X89, a “bot trader” that Ormeus Global marketed a 160% ROI through. Rather than operate legally, Barksdale chose to market Ormeus Global in countries with less than diligent regulation. Globally Ormeus Global never registered its passive ROI trading bot opportunity with securities regulators. At best Ormeus Global was an illegal unregistered securities offering. At worst Ormeus Global was an illegal Ponzi scheme that, either in full or in part, recycled invested funds to meet advertised 160% ROI liabilities. As is typical of MLM cryptocurrency companies, Ormeus Global launched its own exit-scam ICO. Ormeus Coin (ORME) initially launched as Ponzi points. Ormeus Global affiliates invested ORME, at whatever internal rate the company had set at the time. ROI withdrawal requests were submitted through Ormeus Global’s internal exchange, which the company honored with subsequently invested funds. I believe ORME was also tied to the trading bot, allowing Ormeus Global to pay imaginary returns with ORME they generated at little to no cost. Ormeus Global affiliates meanwhile were running around touting annual returns of 4300% through ORME investment. The last phase of Ormeus Global’s exit-scam in late September 2017. On or around September 30th, Ormeus Coin debuted on public exchanges. After a brief pump to $5.19 in November 2017, ORME began to dump as desperate Ormeus Global affiliates tried to recoup their losses. As ORME’s public value approached a dollar, Barksdale washed himself of Ormeus Global and launched IQ Chain. IQ Chain continued the B2X89 trading bot facade and introduced Ormeus Cash and ORV. Ormeus Cash and ORV were a return to Ponzi points, which Barksdale retained full control over and set internal values for. Ormeus Cash was paid out when Ormeus Global affiliates parked their ORME with the company. ORV was distributed through “coin distribution contracts” soliciting investment amounts of up to $250,000. The intended effect of IQ Chain was to halt the selling off of ORME. It flopped and after a minor spike in interest, IQ Chain followed Ormeus Global and went into decline. By this stage ORME’s public value had collapsed to mere cents. Currently ORME is publicly valued at 6.8 cents. The status and internal value of Ormeus Cash and ORV points are unknown. Corresponding with a second spike in traffic to the IQ Chain website, in October it emerged Barksdale had enlisted the services of Organo Gold’s Holton Buggs. Naturally this raised questions as to whether Organo Gold had teamed up with Barksdale to get into cryptocurrency. Organo Gold were quick to respond, with a representative from the company stating ‘un-equivocally, OG wants NOTHING to do with crypto currencies‘. 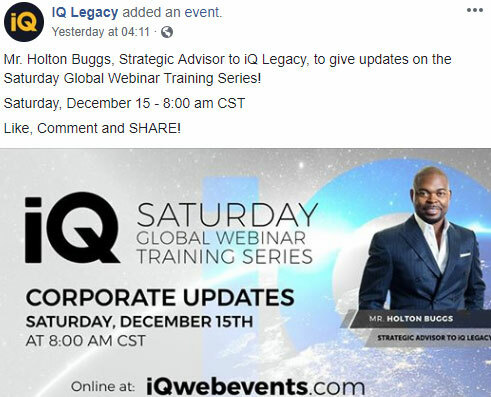 Nonetheless Buggs has retained his Chief Visionary Officer role at Organo Gold, whilst simultaneously strengthening his involvement in IQ Chain. This has no doubt caused internal friction between the parties involved. Publicly Buggs partnership with Barksdale and IQ Chain has led to at least one PR disaster. With the Ormeus Global and IQ Chain brands associated with widespread investor losses, Barksdale has renamed his company for a third time. IQ Legacy was announced about a month or so ago, and is being disingenuously promoted as an entirely new company. In violation of securities law in any jurisdiction securities are regulated, there is no disclosure of Ormeus Global’s and Barksdale’s history on the IQ Legacy website. IQ Bot allows you to leverage an automated trading tool that never sleeps. Set up iQ bot, link it your accounts on one of the available cryptocurrency exchanges, set the parameters, and let iQ bot trade for you. You retain complete control of your money while iQ bot works for you. Automated trading has never been so easy! IQ Legacy fails to disclose specific details of the bot to potential investors, including past audited results. Which is important, seeing as Barksdale first launched the Ormeus Global bot roughly a year and a half ago. Curiously, whereas Organo Gold has vehemently denied any interest in entering the MLM cryptocurrency niche through IQ Chain, its logo is being used to promote IQ Legacy. The above is taken from a December 9th video that was published to the official IQ Legacy YouTube channel. The host of presentation video suggests that Organo Gold’s “assets” will be used to pump value into ORME. [13:45] What’s Organo’s role in all of this? Well Organo has a strategic co-op-etition relationship with Ormeus and Digital Skynet, where there’s an exchange of assets. There’s a co-leveraging, or a cooperative leveraging of assets that kind of helps out each other. 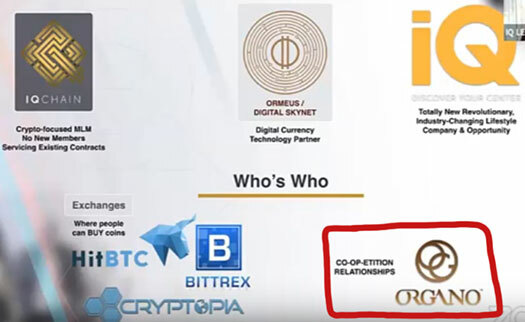 One of the things (the relationship) does is it allows Organo to offer digital currency as part of its reward system, in exchange for leveraging some of its real-world assets to help boost the value of the coins that Ormeus and Digital Skynet are bringing to the marketplace. For reference, Digital Skynet is the parent company Barksdale uses to insulate himself from his various failed MLM ventures. We’ve reached out to Organo Gold corporate for a response to IQ Legacy’s claims. Particularly the suggestion Organo Gold’s assets will be used to prop up IQ Legacy’s digital currency offerings. We’re also curious as to why Organo Gold is partnering with a company seemingly committed to securities fraud. As I write this the Alexa cite the US as the only significant source of traffic to the IQ Legacy website (71%). Pseudo-compliance “we don’t market in the US” or no, IQ Legacy is being promoted within the US and is soliciting investment from US residents. At the time of publication neither John Barksdale, Ormeus Global, IQ Chain, IQ Legacy or Holton Buggs are registered to offer securities within the US (or anywhere in the world for that matter). On the compensation plan side of things, it doesn’t appear much has changed between IQ Chain and IQ Legacy. There is of course the automated returns paid through the supposed AI bot, although specifics are not disclosed on the IQ Legacy website. 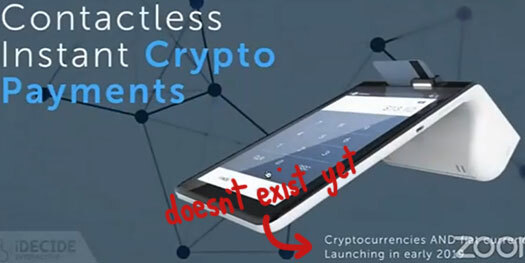 One addition appears to be promotion of a point of sale tied to IQ Legacy, through which payments in cryptocurrency can supposedly be made. Again, details of this, including which cryptocurrencies will be accepted (only ORME? ), are not provided on the IQ Legacy website. What we do know is IQ Legacy affiliate membership is $99 a month (commissionable) plus the purchase of a a Bronze, Silver, Gold or Platinum pack. Notably, IQ Legacy are only accepting bitcoin from affiliates (what, I can’t pay in ORME?). Residual commissions are paid out via a binary compensation structure. Through various ranks, an IQ Legacy affiliate is able to increase their residual commission rate to 15%, capped at $175,000 a week. Retail trading bot access is apparently possible but no details are provided on the IQ Legacy website. Recruitment commissions are paid on package purchases by newly recruited affiliates, providing an additional pyramid layer to the scheme. I say that because neither Ormeus Global or IQ Chain managed to generate any significant retail customer interest. IQ Legacy being not much different will likely turn out the same. In addition to the regulatory red flags we’ve already covered, IQ Legacy have also implemented “pay to play” by tying residual commission rates to how much a new affiliate pays when they sign up. I also want to drive home IQ Legacy’s use of bitcoin. When you sign up to IQ Legacy your only option is to pay in bitcoin. IQ Legacy doesn’t accept ORME, Ormeus Cash or ORV points, which is telling of their actual worth. IQ Legacy also only pay out commissions in bitcoin. This bypasses banking and securities regulations, effectively allowing IQ Legacy to fly under the radar till it’s probably too late. Speaking of which, if IQ Legacy follows Ormeus Global and IQ Legacy, affiliates will have no recourse to recover their losses. By the time regulators get involved funds paid to IQ Legacy will have been laundered who knows where (in violation of securities and financial regulations globally). Given how Ormeus Global and IQ Chain turned out, I can’t understate the significance of IQ Legacy only accepting and paying out bitcoin. If I can break down IQ Legacy into its simplest form; you’re paying to invest in a bot that has no provided verifiable results (required to be disclosed for compliance), despite the bot originally launching last year. 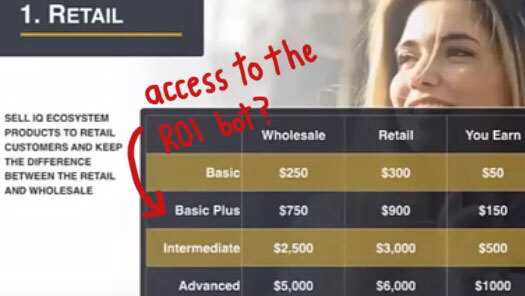 Retail is possible but given the complete lack of retail interest in Ormeus Global and IQ Chain, IQ Legacy affiliates are going to be primarily paid to recruit new affiliates. John Barksdale began his MLM cryptocurrency journey around eighteen months ago. Through repeated failures that have primarily revolved around illegal securities offering, Barksdale has built a veritable house of cards. One regulatory cease and desist or subpoena for information, and it all comes crashing down. Next story Crypto Adoption Surges Even as Prices Plunge!